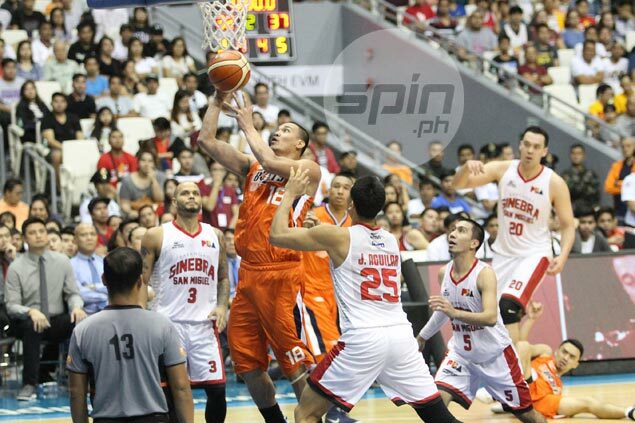 BOCAUE - Meralco's frontcourt may be outnumbered, but it couldn't be outdone on Sunday night. Jason Ballesteros scored the game-winning putback then preserved the result with a solid defensive play as the Bolts survived Ginebra, 84-82, to keep their flickering quarterfinal hopes alive in the PBA Philippine Cup. The Bolts registered their second straight win and fourth in 10 games to claim a piece of ninth spot, preventing the Gin Kings from clinching a playoff berth after dropping to 5-5 following their Governors' Cup Finals rematch. "It was just a great effort from the guys considering the circumstances," Bolts coach Norman Black said. "We had nothing to lose - we had a game to lose, but nobody expected us to win." Garvo Lanete typified the Bolts' pressure-free play, sustaining his hot shooting by pouring in all his team-high 19 points in the last three quarters. The third-year gunner conspired with Anjo Caram, who also continued his efficient play with 16 points, three boards, and one steal while playing solid defense on LA Tenorio in 30 minutes as he repaid Black's faith in a rare start. But it was Ballesteros who anchored the middle for a Bolts team that was missing Cliff Hodge, Ranidel de Ocampo, and Jared Dilinger. Re-acquired from the free-agent market, Ballesteros emerged the unlikely hero as he hauled down 17 rebounds, including the one that led to the go-ahead basket, and added seven points, before challenging Japeth Aguilar's pontential game-winning three-point attempt. Aguilar paced the Gin Kings with 20 points, seven boards, and three assists, while Scottie Thompson added 17 points, 13 rebounds, and five assists that went to waste.